The most crowded crowd I’ve ever been part of was at President Barack Obama’s inauguration in 2009, when I was a freshman at Georgetown. I stood, packed in with 1.8 million of my closest friends, in the freezing wind on the National Mall. We left campus in the middle of the night in order to secure a spot, huddled in the dark for hours, and then watched the sun come up over the Smithsonian as we waited for the ceremony to begin. It wasn’t until I complained to my dad later (about the extreme cold, the wait, how tired and hungry I was) that he mentioned I probably could have just skipped it and said I was there. Who would know? I’m on the fence about this still. It was an historic event, so I’m glad I witnessed it. Had I lost some toes to frostbite that day, I might feel differently — and it was a close call at some points. But I am mostly glad I went, and feel like I was part of Barack Obama’s special day, for which he was undeniably, absolutely present. In the flesh. Right there on stage. The real deal. Which sits in sharp contrast to another historic moment, occurring 40 years earlier, when another massive crowd gathered in unbearable weather to witness another “first” for the United States. It’s July 20, 1969. The Florida heat is settling in over Cape Kennedy, where nearly a million people have gathered to watch the first-ever landing of a man on the moon. Apollo 11 launched just four days before, and now the astronauts have confirmed with Mission Control in Houston that they’re not just planning to land on the moon, but are going to exit the relative safety of the spacecraft and walk with human legs and feet on the unknown surface of not-Earth where no man has gone before. The three men aboard the rocket hurtling toward the moon are Neil Armstrong, Buzz Aldrin and Michael Collins. Back in Cape Kennedy, the crowd is growing larger. Watching this historic moment unfold on live television was a life-changing experience for many Americans, to be sure. But for the people that had come from near and far to this tiny spot in the southeastern corner of the country, it was a life-changing…party. Cape Kennedy was packed with tourists, NASA staffers and families, space and science hobbyists and Floridians, grilling on barbecues, trying out fancy telescopes and cameras, and knocking back beer for miles and miles. A thousand police officers worked overnight to keep 350,000 cars and boats from gridlocking the streets and waterways. The Banana River was packed with viewers on boats; above, bleacher seating held VIPs including half the members of Congress, 19 state governors, forty city mayors, a couple Supreme Court justices, Vice President Spiro Agnew and Johnny Carson. And they’re all waiting for the footstep that would change the world. 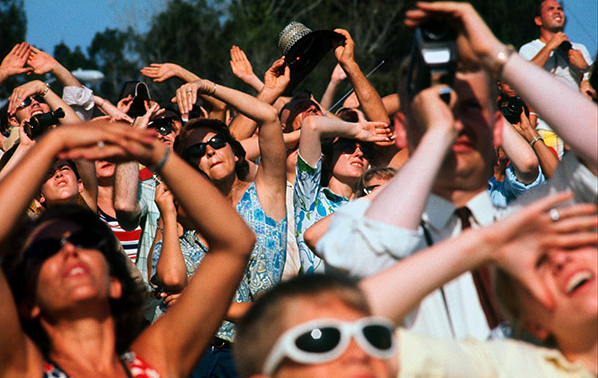 Picture this: when the rocket went up, a million heads turned toward up the skies, peering into the distance. Another 200 million stared intently at their home television screens with bated breath. And when word came that the mission had been successful, an entire nation went ballistic. Celebrations reverberated from coast to coast. People lost it. Televisions and radios blared the news; newspapers ran half-page headlines; it was sheer madness. Nowhere was this more true than at the party down at Cape Kennedy. Raucous cheers, celebrations, and joy filled the air. But the astronauts…the guests of honor… were not there. Of course, taking my dad’s advice, since it had been just so crowded at Cape Kennedy that day, the three astronauts could have always just said they were there for it. Who would know?